This article series follows my learning process as I set out to build the lightest hunting rifle I could without sacrificing accuracy. Part 1 is an overview, Part 2 covers barrels, and Part 3 discusses stocks. In every instance, this blog series only exists because of the industry professionals who’ve been generous with their time and have allowed me to pepper them with questions. Most recently, I caught up with Mike Lee, head of sales and marketing at Defiance Machine, to learn more about the importance of a quality rifle action. By all rights, an action is the central hub to which all other rifle components are directly attached. Barrel, stock and optic become one cohesive unit via the receiver. My interest in Defiance piqued while trying to decide whether to build my rifle on a titanium action or a skeletonized stainless steel model. Ultimately, I purchased a short-action Defiance Deviant Ultralight. It’s the company’s lightest action, and it’s stainless steel. This action has heavy faceting on most surfaces, deep bolt fluting, a minimalist tang, and an integral, interrupted picatinny rail which has been milled out. More on the factors that lead me to choose this option instead of a titanium action later. Before Mike and I got onto the topic of actions, we swapped some hunting stories. He’s an Oregon native, transplanted to the Flathead Valley of Montana. Last year he harvested a fantastic mountain goat in Montana’s wilderness. The shot was 500 yards, and the goat never rose from its bed. Mike’s affinity for firearms, hunting and a career as a machinist all started early. He spent 15 years in machine shops and the firearms industry before eventually meeting Glen Harrison, the founder of Defiance Machine in 2009. When Mike and Glen’s paths converged, Mike became Defiance Machine’s first employee. They now operate 21 CNC machines producing 500 actions per month. Founding a company that manufactures high-end rifle components in the lull of the 2008 economic downturn was no small feat, but Glen’s vision to produce only the very best action money can buy has carried the firm to where it is today. Most current Defiance actions fit a Remington 700 footprint, but that’s where the similarities stop. Factory actions are mass produced for maximum profitability, while a Defiance custom action is produced one at a time. Aside from the greatly more precise machine work, Defiance actions have design features that increase accuracy and functionality. For example, a guided firing pin. Some custom manufacturers and gunsmiths will use lightweight firing pins in an attempt to reduce locktime. But a lightweight firing pin requires a more powerful spring to recuperate the inertia needed to property dent a primer. With a stronger spring, vibration is increased, offsetting any advantage that decreased locktime may provide. A guided firing pin is just one of many features that make Defiance actions exceedingly accurate. It’s also worth mentioning that every single piece of each action is made under the same roof. Not all custom action manufacturers can say that. But beyond accuracy, Defiance Machine actions are 100 percent customizable. Yes, trillion, with a T.
Each receiver starts life as a piece of 416 stainless steel. The same goes for the bolt, though it’s made of 4340 chrome moly steel. The bolt, lugs, and handle are monolithic. The steel arrives at the shop in 12-foot lengths. It gets cut, and goes straight from the saw to a lathe that gun drills the bolt bore, cuts the barrel threads, the receiver face and the locking lug abutments all in one fell swoop. The fact that these operations take place together is vital, because the relationship between these features is critical to accuracy. Then, the outside diameter of the material is turned, and it goes into a wire EDM (Electrical Discharge Machines) to get the lugways cut. In a CNC-controlled EDM, a .012-inch brass wire emits a spark that erodes the steel without ever touching it. It burns a .012” wide path through 10” of hardened steel with pinpoint accuracy. 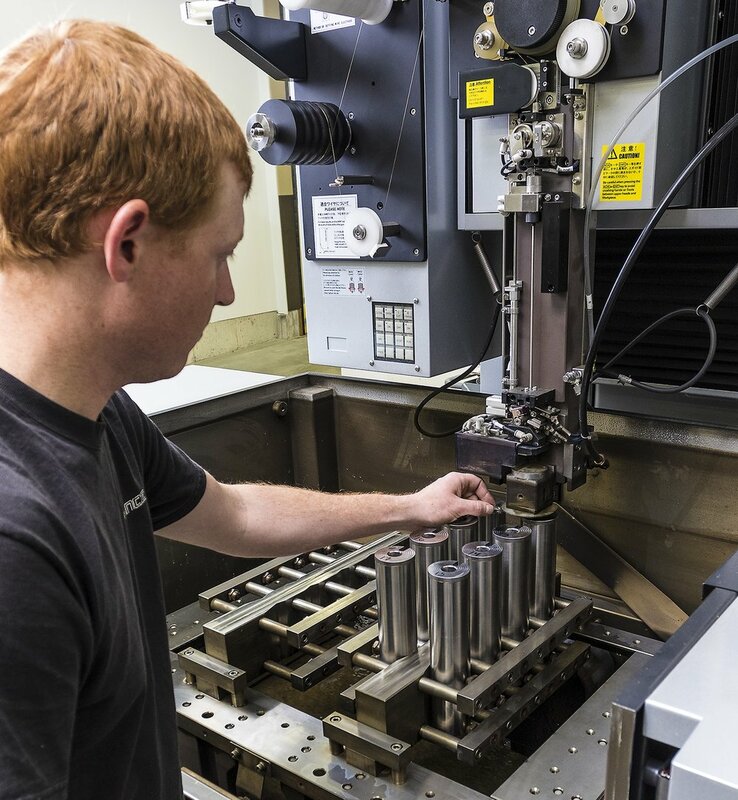 Once out of the EDM, the receiver blank is placed in a 5-axis CNC machine to be customized to the customer’s specs in two operations. It’s here that the blank really becomes an action. To maintain their stringent quality, Defiance uses only the very best CNC machines and tooling. 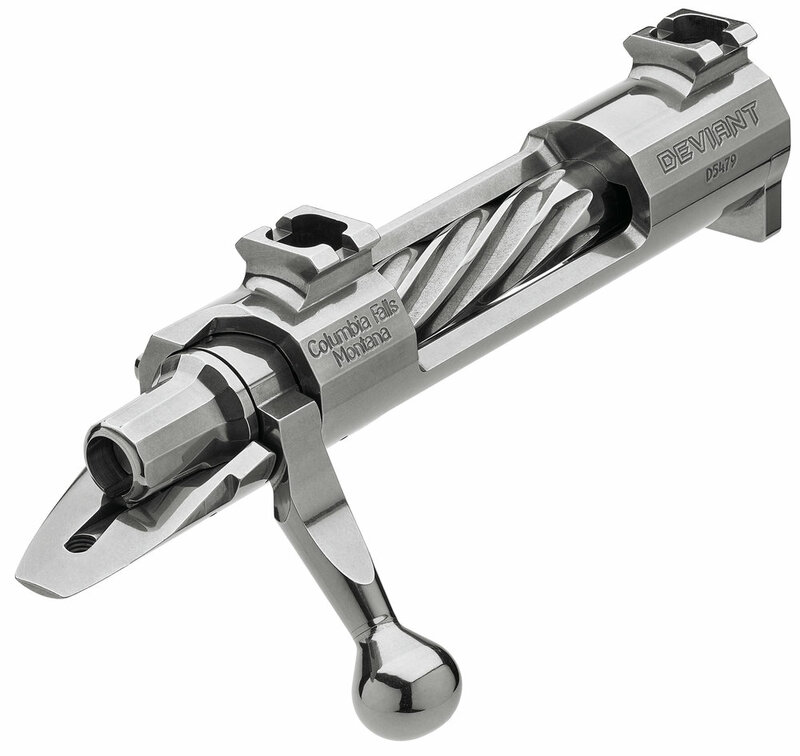 No heat treatments are performed after the action or its parts are machined. Again, this is to avoid stress. So, why did I choose a steel action over a titanium one? From the very get-go, I was a bit hesitant about titanium because of a few bad experiences that friends of mine had. But the desire to build a really light hunting rifle still weighed heavily on my mind. After a bit more research, and learning that the Defiance Deviant Ultralight was a mere 2.5 ounces heavier than a comparable titanium model, the decision was easy. Titanium, as it is currently utilized in rifle actions, is an imperfect metal for a bolt action receiver. It galls far more easily than stainless. This could, over much use, become an issue in the bolt lugways, where constant friction could erode or change the surface texture of the metal. Would it matter? That depends how much you shoot your rifle. But the bigger challenge with titanium is deflection, or how much the material expands under pressure. Bolt thrust is what it sounds like. It’s the force of the bolt being pressed backward against the lug abutments when the rifle is fired. When this happens, the entire receiver, and especially the abutments, move, or wave, in an force called deflection. How much the material deflects determines how much the brass casing will yield to the instantaneously-expanded chamber. While this can effect accuracy (remember that vibration and movement are the enemy of accuracy), it can also affect the consistency of the fire-formed brass. It’s worth mentioning that the lubricity and surface corrosion properties of any action can be improved with the use of surface treatments. Cerakoting gained popularity over the past decade or so, but many picky gun owners are now looking for the next best thing. This is especially true on bolts. Defiance Machine currently offers two different surface treatments; salt bath nitride and DLC (Diamond Like Carbon). Both add hardness to the surface which makes the action slicker, improves corrosion resistance, and colors the steel black. I’d be remiss to write an article about rifle actions and not cover the use of a “blueprinted” factory action in place of a custom action. Sometimes referred to as a “balanced” action, blueprinting is the process of making (or attempting to make) a factory action concentric and square: The bore to the receiver threads, the threads to the receiver body, the bolt face to the bore, etc. This is all because these specs are generally off when a mass-produced factory action comes off the line. It’s not that you can’t get phenomenal results with a blueprinted action, it’s that the results are far from consistent, depending on who did the work, and how they did it. And even if it was done meticulously, the action still features the same material and functionality of a factory action. A blueprint job will only be as accurate as the tools and methods used. Doing it with hand tools assumes that you’re improving the factory job, and that’s a huge assumption. A blueprint job can only be as accurate as the tools used. In summary, if you’re going to build a rifle from the ground up, starting with a custom action is going to put you ahead of the game. Keep in mind, not all custom actions are created equal. Do your homework, ask questions, and read reviews. Better yet, see if you can get your hands on a few different models before settling on an action company. It’ll be time well invested. Q: As a custom action manufacturer, what advice would you give someone looking at building a custom gun... and that may be in regard to actions, other components, the whole process, etc. A: There are lots of options. I suggest calling manufacturers and talking to a representative. You can get a good feel for the support you can expect after the sale by the customer service you get before the sale. There is no need to compromise. There are enough options with rifle actions, barrels, stocks, and triggers, to build the perfect rifle regardless of your needs. Q: Any advice to help a consumer pick a good gunsmith? A: Modern custom rifles are capable of amazing things. When you buy all the best components, you should make sure someone is going to do them justice. Do some research and find someone with a good reputation. Q: What's next for Defiance? Is there anything on the horizon that you can share with readers? A: There are always new designs in the background at Defiance. Design and innovation are what drive our founder (Glen Harrison), and what drives our company. We have our new Deviant Elite with an extended rail and thread tennon. And, we have new detachable magazines for our XM length actions. (10 rounds of short mag, loaded up to 3.25” long. 15 rounds of .308 sized cases). These are all currently available. There are new products being designed, programmed, and tested right now, but we’ll wait to talk about those.